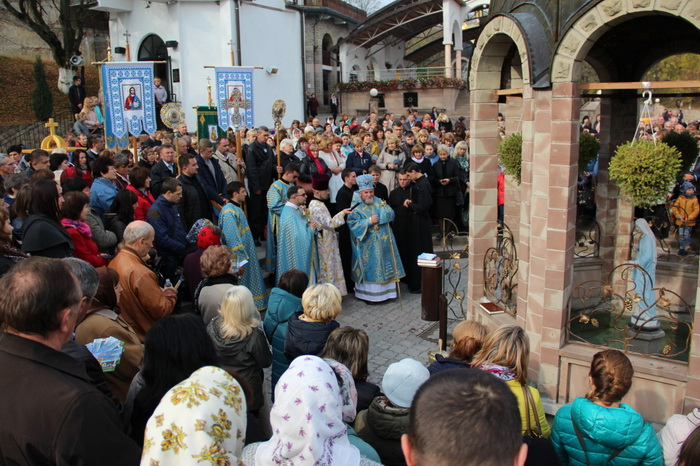 On October 21 in Marian spiritual center “Zarvanytsia” the fifth professional pilgrimage for employees of social sphere and state pension fund of Ternopil region took place. The pilgrimage was headed by Archbishop and Metropolitan of Ternopil-Zboriv Vasyl (Semeniuk), who led Pontifical Divine Liturgy and welcomed leaders of institutions and all participants of the professional pilgrimage. Afterwards there was blessing of the water and the Way of the Cross was celebrated. In the chapel of Saint George there was memorial service for the heroes, who gave their lives for freedom and independence of Ukraine. At the end pilgrims venerated Wonderworking Icon of Mother of God of Zarvanytsia at the Holy Trinity and Intercession of the Theotokos parish church.